Want to do work in Railway department then, now you have great chance to start doing a career in Indian railway department with the Posts of Trade Posts and get selected on the basis of merit list (As per Qualifications). As RRC Central Railway department inviting interested candidates for appointed of 9345 Group D Level-1 Posts Bumper Posts Jobs vacancy under Railway recruitment cell overall in Mumbai. If you possess minimum eligibility (As mentioned Below) then, you can do online registration from the official portal website of RRC Mumbai i.e www.cr.indianrailways.gov.in (Note: No other Apply Method will be accepted). We are requesting the candidates that, they must first go through official notification & all important detail regarding RRC CR recruitment 2019. RRC, Mumbai has authorized to recruitment intended candidates under Group D Level-1 trades Posts under Central Railway zone. Railway recruitment cells are responsible for recruiting Group C & Group D Posts in Indian Railway. Now, current running vacancies Posts is Level-1 Posts. Who’s application form available from 12-03-2019 to 12-04-2019. Below we share all rrb cr recruitment current running & upcoming Posts notification detail so, stay tuned with us. 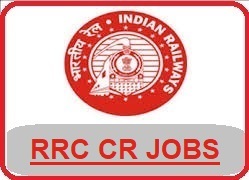 If you are not eligible for RRC Central Railway (CR) Current running notification then, you can also check other 17 railway recruitment cells wise Jobs notification from the link Below. If you are looking for more notification to be released by Railway recruitment under Central Railway cell then, you can visit this page every day or just subscribe our website to get direct recruitment in your E-mail So, that you never miss any Jobs notification from cr railway recruitment cell. I need any kind of job plz help me sir i m bellong poor familly . cant find form link i need proper link please help . What will be the selection criteria for group C? I am 49 years old and working with ALLIANCE ENGG.CO.,AS STENOGRAPHER SINCE JULY 1991. SHALL I APPLY FOR THIS JOB? My name is DHARMENDRA VERMA from. I have completed HSC from Maharashtra board .I have pursuing BBA degree from pune university.I need this job RRB. sir mujhe koi job mil sakati hai kya? main ab 31 year saal ka hun. B.A. complete MS-CIT, CCC, DTP, TALLY Basic hua hai. bahout jaroori hia. i will give a job government of railway job its my father decide to get a jof of govenrment. its my request sor please accept. Sir I need this job. I am pavninder singh state Punjab District shri Muktsar sahib village Roranwali part1 Qualification 10th 1 year pass pin code 152113 Plzzzzzz Sir call me. ..